2019 JUNIOR SAILING COURSE REGISTRATION NOW OPEN! Come for the Sailing, Join the Tradition, Everyone Welcome! Electronic transfer to the Financial Manager at finance@cyc.pe.ca. Mail cheque or credit card information to P.O. Box 1024 Charlottetown, PE C1A 7M4. Cash, cheque or credit card to the Operations Manager, Lisa MacKinnon. There will be no invoices, so don't wait for a reminder please. Pay for a full membership and get a slip fee reduction of 50% for select spots in the marina. This special is only for new members to the CYC. - and much more, see full list below. 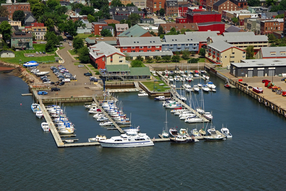 Charlottetown Yacht Club members contribute to CYC in many different ways, including volunteering their time or making financial contributions. The CYC Executive thanks members who are donating to cover the purchase of the new East Coast Docks Junior Sailing docking system.